WASHINGTON, D.C. -- Seventy percent of Americans have "a great deal" or "a fair amount" of confidence in the U.S. government to protect its citizens from future acts of terrorism. This reflects a recovery of confidence from the last time the question was asked, immediately after a terrorist shooting in San Bernardino, California, when 14 people were killed. These data, from a June 7-11 poll, are Gallup's first measurement of Americans' trust in the federal government to protect citizens from terrorism since President Donald Trump took office. Leading up to this poll, two major terrorist attacks occurred in the United Kingdom in May and June. Confidence in the U.S. government's ability to protect against terrorism was highest in Gallup's initial measurement, in September 2001, conducted shortly after the 9/11 attacks. As the public rallied around its leaders, 88% expressed confidence in the government to combat terrorism. Confidence in the government's protection under George W. Bush ranged from 73% to 82% in post-9/11 readings. Americans' confidence in the government to protect citizens from terrorism held steady under President Barack Obama until 2015, when it dipped slightly to 67% in June before dropping further to 55% in December after the San Bernardino attack. 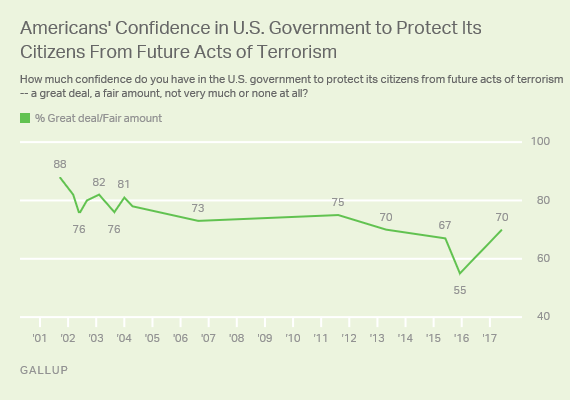 As Americans' confidence in the government to protect them has recovered since late 2015, their worries about falling victim to terrorism have also declined to more typical levels. Forty-two percent now say they are "very" or "somewhat worried" that they or a family member will be a victim, down from 51% after San Bernardino. An average of 41% of Americans have expressed this sentiment since Gallup first asked this question in 1995. In only a few polls since 1995 have a majority of Americans worried about being a victim of terrorism. Those were the four surveys conducted within a month after 9/11, as well as the 2015 poll after the events in San Bernardino. U.S. adults were least worried in 2000, when 24% expressed concern. Since 9/11, the low point in worry has been 28% in 2004. Though less than half of Americans worry they will be a victim of terrorism, six in 10 say it is "very" or "somewhat likely" that an act of terror will take place in the U.S. in the next several weeks. This is down from the post-San Bernardino poll, when two in three Americans (67%) believed an attack was coming. 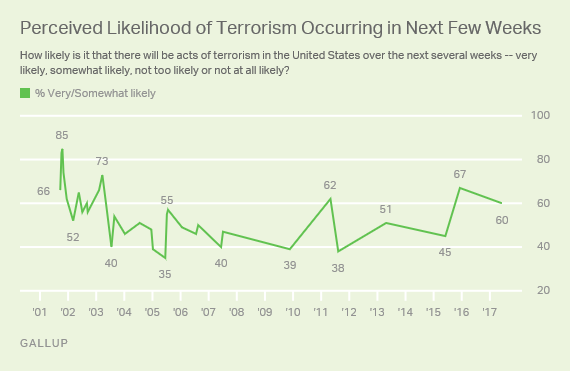 Since Gallup first asked this question in the days after 9/11, the average percentage expecting a terrorist attack in the near future has been 55%. Expectations are usually greater in the wake of a recent terrorist attack and reduced when there has been no recent terror activity. Anticipation of an attack was greatest in the month after 9/11, at 83% and 85% in separate polls in October 2001. By June 2005, expectations of terrorism in the U.S. had waned to 35% -- the lowest in Gallup's trend. But by the following month, expectations spiked again after coordinated bombings by suicide attackers on London's subway system and a double-decker bus, leaving 52 victims dead and hundreds wounded. Expectations of another attack spiked again, rising to 62%, after Osama bin Laden was killed in 2011. Majorities of Americans over the years have expressed confidence in their government to protect its citizens against terrorism. However, the level of trust has varied and remains lower than it was in the years immediately after 9/11. While confidence in the government to protect against terrorism was high after the 9/11 attacks, the 2015 attack in San Bernardino had the opposite effect -- confidence in federal protection declined to a record low. Trump campaigned bluntly as a candidate who would protect Americans from terrorism as well as other threats against their safety, promising strict measures that would keep the country safe. The president receives his highest approval rating for his handling of terrorism. But Americans' fears have fluctuated in the post-9/11 world and are susceptible to flaring up yet again when events occur at home or abroad. A median of more than six in 10 residents across 14 European countries say terrorism is a serious problem; 55% say the same about immigration levels. President Donald Trump's approval ratings on 10 key issues range from a high of 46% for his handling of terrorism to 28% for healthcare policy.